Line M of Qom metro is currently under construction. This is the monorail line of the city. 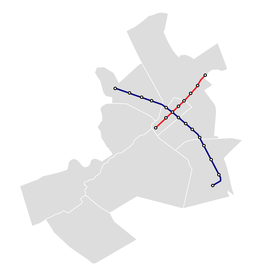 The line was originally planned to span the whole city East-West, but it was cut to its current length, with the extension saved for further consideration later. The line connects Fatima Masumeh Shrine to locations upstream and downstream of Qom River. Line A of Qom metro is an actual underground metro line currently under construction, due for opening in March 2019. The line has a length of14 km, and 14 stations, extending from the Northern edge of the city, passing through near Qom railway station, near Fatima Masumeh Shrine, and further south, terminating at Jamkaran Mosque. Two other metro lines are being considered for construction. This page was last edited on 30 January 2019, at 04:04 (UTC).